Hi everyone! It’s that time of the year again for the Day of the Dead exhibit that I co-curate with my dad! 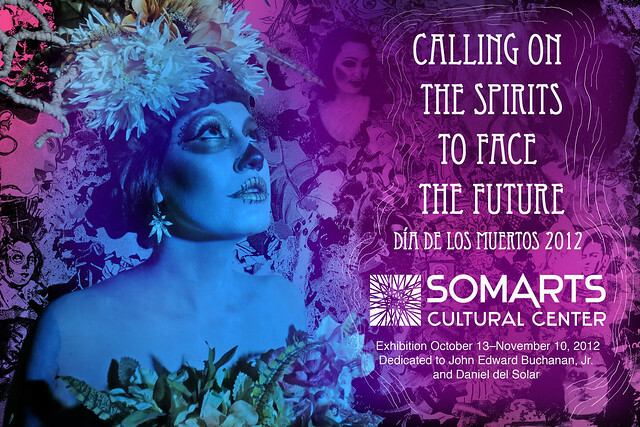 Enjoy the unveiling of intricate, traditional altars and complex art installations created by more than 80 Bay Area artists as part of SOMArts Cultural Center’s 13th annual Day of the Dead exhibition, Calling on the Spirits to Face the Future: Día de los Muertos 2012. The opening reception features live music and painting, interactive installations, Frida Kahlo themed performances and an artists market. Gathering the Embers: A Dia de los Muertos Tribute Show 2012, Saturday, October 20, 7–9:30pm, $8 in advance & $10 at the door. In this 2nd annual performance showcase, sisters Natalia and Amanda Vigil gather emerging and established writers, interdisciplinary performing artists, media makers and musicians to pay tribute to love, life, loss and resiliency. Saturday, October 27, 8pm–10pm, $10 in advance & $15 at the door. The Bernal Hill Players is an adventurous San Francisco chamber music group specializing in eclectic programs. They will present two world premieres by Mexican composers Guillermo Galindo and Eduardo Gamboa inspired by neighborhoods of Mexico City. Additional chamber music to be performed includes Zarabandeo by Mexican composer Arturo Márquez, La Muerte del Ángel by Argentinian composer Astor Piazzolla, Cuarteto by the Cuban-American composer Joaquín Nin-Culmell, Choros No. 2 by Brazilian composer Heitor Villa-Lobos, and favorites of the folk and popular literature, La Llorona and Granada. 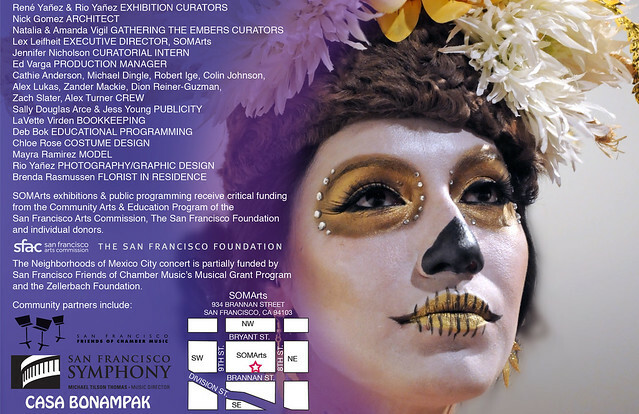 Concert guests may arrive early to visit the art exhibition Calling on the Spirits to Face the Future: Dia de los Muertos 2012. Click here to read more. Saturday, November 10, 6pm–9pm, $7–10 sliding scale admission. 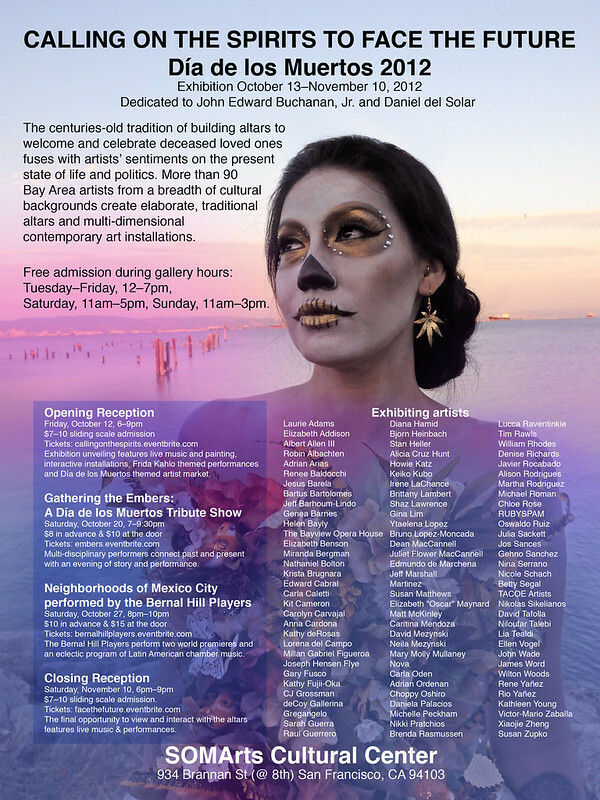 The closing reception for Calling on the Spirits to Face the Future: Día de los Muertos 2012 group exhibition is the final opportunity to view and interact with intricate, traditional altars and complex art installations created by more than 80 Bay Area artists. Music and performance to be announced. To see more photos from my yearly shoot with Mayra Ramirez CLICK HERE. Hi Rio- I came across your Dia de los Muertos 2012 flyer and postcard at ActivSpace Mission. I’m so much impressed with artwork and photography. Thank you for your all your works. True blessings for Humanity. Hoping to see the exhibit later today.